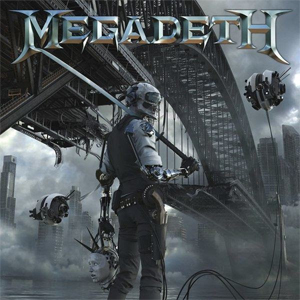 MEGADETH has announced that their new album, the band's fifteenth, will be called Dystopia and is due out on January 16th via Univeral Music Enterprises. In anticipation of the release the band is streaming a single from the album for the track “Fatal Illusion”, and you can check it out below. Dystopia was produced by Mustaine and Toby Wright (ALICE IN CHAINS, KORN). This will be the first release with MEGADETH’s new lineup that features founding members Dave Mustaine (guitar, vocals) and David Ellefson (bass) along with LAMB OF GOD drummer Chris Adler and Brazilian-born ex-ANGRA guitarist Kiko Loureiro. MEGADETH recently announced an October tour of Australia with special guests CHILDREN OF BODOM. Tour details and ticket information can be found right HERE.